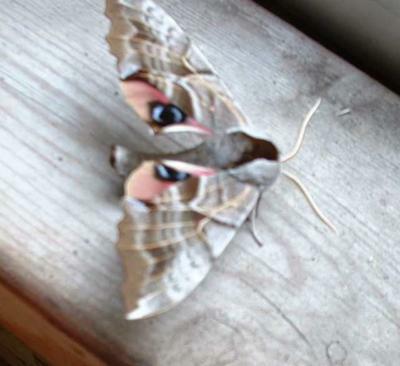 This is one of the larger moths around my place - if I leave the porch light on too late in the evening, I'm likely to find one stranded on the porch in the morning. They have incredibly meaty bodies, which are almost too much to bear touching. The wingspan is 50-70mm, or around 2 - 2 3/4", with somewhat drab colouration until they flex their wings to show the 'eyes' - very realistic looking markings that are the most gorgeous blue, surrounded by pale pink, yellow or red shading. The similar Cerisy's Sphinx has no black line through the blue 'eye', but is otherwise almost identical. The caterpillars are bluish green with several pale yellow diagonal stripes, and a greenish yellow horn. The caterpillars are very similar to the Sphinx Moth Caterpillar shown here. This caterpillar is most likely the Wild-Cherry Sphinx, which eats, you guessed it, wild cherry, such as the Prunus melanocarpa that grows in the valleys, as well as the leaves of other fruit trees in orchards too. The Twin Spotted caterpillars favorite food is willows, mostly the native Salix bebbiana and similar plants, so is seen most often in low lying areas along riverbanks where those types of shrubs are likely to grow. Join in and write your own page! It's easy to do. How? Simply click here to return to Insect Encyclopedia.